For the Farro: Place the farro in a mesh sieve and rinse with cold water. Drain well and set aside. 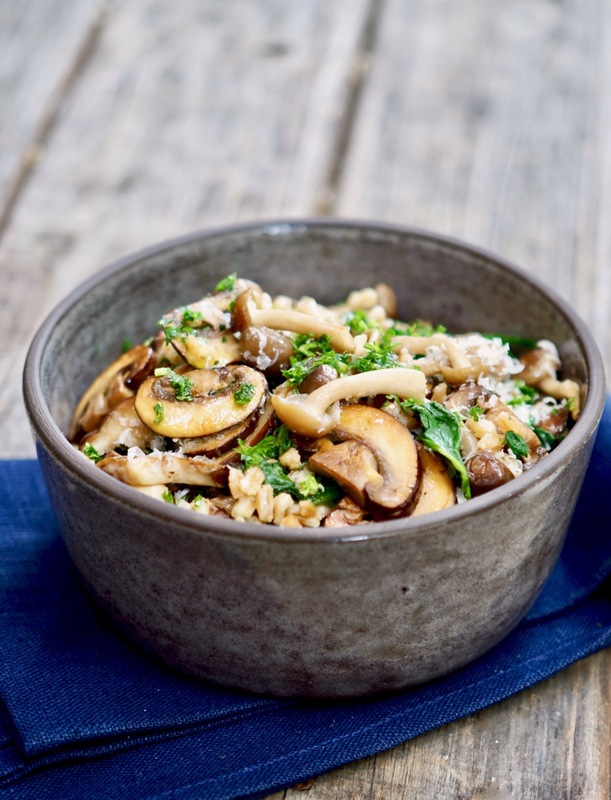 Transfer the farro to a medium size saucepan. Add the chicken stock and a dash of salt. Place over medium-high heat and bring to a boil. Reduce the heat to low, cover and cook for about 25-30 minutes until softened but still slightly chewy. Remove from the heat and drain any remaining liquid. For the Mushrooms: Place a large sauce pan over medium-high heat. Add two tablespoons of oil. When hot, but not smoking, add the sliced mushrooms. Allow to cook, undisturbed for a few minutes. Add the garlic and cook until fragrant, about 30 seconds longer. Remove form the heat. 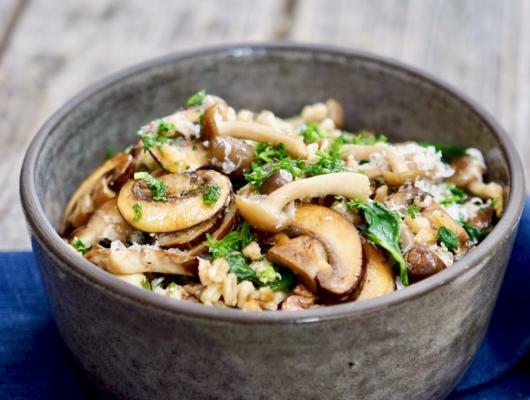 Add the cooked farro to the mushrooms. Add the remaining 1 tablespoon of olive oil, salt, pepper, truffle oil, parmesan cheese, chopped spinach and parsley, toss well to coat. Taste and adjust the seasoning as needed. Serve warm or room temperature.